Summary: Fresh from her debut, The Stranger You Seek—which Publishers Weekly called “an explosive, unpredictable, and psychologically complex thriller that turns crime fiction clichés inside out”—Amanda Kyle Williams delivers a second thrilling Keye Street novel, perfect for fans of Karin Slaughter and Patricia Cornwell. 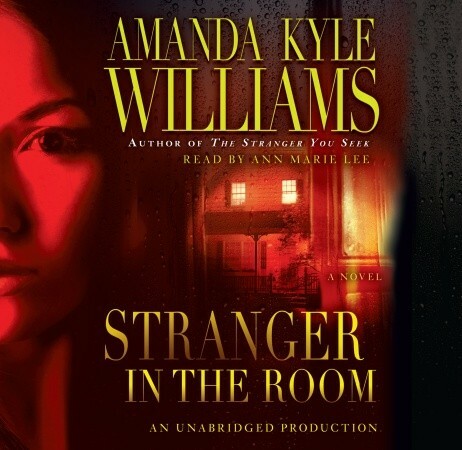 Last summer, I was excited to "discover" a debut mystery writer named Amanda Kyle Williams. Her first book was called THE STRANGER YOU SEEK, and I was definitely impressed with the many twists and turns in the story. You can read my review here. I was also pretty happy to learn that this novel was the first in a new series. Fast forward a year and the second book in the Keye Street series, STRANGER IN THE ROOM, was released. Of course, I was anxious to read it and find out what was in store for Keye, but this time I decided to "read" it as an audio book. I'm not sure I enjoyed STRANGER IN THE ROOM quite as much as I did the debut novel, maybe because my expectations were pretty high; however, I still enjoyed it... and it definitely kept me guessing. 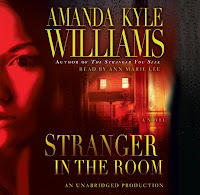 STRANGER IN THE ROOM once again takes place in Georgia, and private investigator and ex-FBI profiler Keye Street finds herself smack dab in the middle of some very unusual cases. The first one involves her unstable cousin Miki who swears that she is being followed and then threatened by a stranger. As much as Keye would like to help Miki (she is family after all), in the back of her mind, she questions the veracity of Miki's story. Miki isn't exactly the most dependable of individuals given her history of alcohol and drug use as well as her mental issues. In the meantime, Keye's boyfriend and Atlanta Police Department Homicide Detective Aaron Rauser is working on a case involving the murder of a young thirteen year old boy. When another murder occurs, this time the hanging of an elderly man, Keye finds herself involved in both cases... both personally and professionally. At first glance, the cases seem to have virtually nothing in common, but Keye can't help but think they are related. Using her skills as a profiler, she somehow pieces together information about both crimes and comes up with a hypothesis! However, I did think the rest of STRANGER IN THE ROOM was intriguing and enjoyable (not that I didn't like the crematorium story, I just felt like it was dropped in there!) As was the case in the first novel, I appreciated the character development of Keye and how it explored her addiction and recovery issues. In addition, I still liked Keye's spunky personality and the way she bantered with her boyfriend, her cousin, her co-worker, and basically any one who came into her path. While I did think the basic mystery behind the murders was very complex and well constructed, I admit that I initially had some issues with how Keye managed to link the events. It was a little far-fetched to me that Keye even suspected that the crimes were related, but she was a renowned profiler for a reason, right? I also really liked the pace of the novel. Once the story about the crematorium was out of the way, the action with the murders really took off. I thought the story was suspenseful and full of twists, and I appreciated how Keye began using her skills to narrow the search for the murderer. Many of Keye's ideas about the murderer were "out there" and nothing an ordinary person would suspect; however, I found her thought processes to be extremely interesting. In addition, I enjoyed the different psychological aspects of the story -- the ones pertaining to the crimes as well as the ones directly relating to Keye and her cousin. The audiobook was read by Ann Marie Lee, and for the most part, I thought she did a good job with her interpretation. I'm not the best judge of Southern accents (for that, you need to talk to Kathy), but I'm not sure about a few of her pronunciations of certain words like "aunt." What I did like about her narration was the variety of voices she used for the different characters and the way she built tension in the story. I also thought she did a good job of capturing Keye's snarkiness and sense of humor. Overall, I enjoyed STRANGER IN THE ROOM quite a bit especially the parts of the novel that had to do with the murders of the young boy and the elderly man; and I look forward to the next installment of Keye Street novels. Definitely recommended for fans of Karin Slaughter and psychological thrillers with strong female protagonists. You had me when you mentioned this book is set in the ATL - I love books that are set in places that are familiar to me. This "it felt almost a little Stephanie Plum-ish" was kind of killer for me. I know I'm in the minority, but I'm not a big Stephanie Plum fan. Ha ha, loved your comment about Kathy!! !